We’ve all heard the excuses. “There aren’t more movies about women and for women because no one would watch them.” “Female-driven movies don’t do well at the box office.” “Women aren’t funny.” (We’re still wincing over that last one to be honest.) But then, every so often, a movie like Girls Trip comes along to smash those excuses. And, you know, the patriarchy. There are many things to love about this movie, the primary one being that it puts four empowered women front and center. Regina Hall, Queen Latifah, Jada Pinkett Smith and Tiffany Haddish star as lifelong friends who head to New Orleans to attend the annual Essence Festival. Suffice it to say things get wild enough in the Big Easy to earn the movie every bit of its R rating. With the film being released this week on Blu-Ray and DVD, Pinkett Smith hopped on a call with us to chat about the roles women play in Hollywood… both in front of and behind the camera. Coincidentally, Pinkett Smith and Latifah (or “La” as Pinkett Smith has affectionately dubbed her) starred together in another movie about four strong women. That film, ‘96’s Set It Off, featured the female leads as inner-city women driven by their own desperation to bank robbery. In Girls Trip, the four female leads are each successful in their own way, among them an Oprah-like media maven and a Perez Hilton-style gossip guru. Part of the rusty Hollywood cog that could use oiling is that of putting men in charge of telling women’s stories. “If Girls Trip is not your experience, you’re not going to look at it as a movie that’s important to make. In a male-dominated culture that Hollywood can be at times, you would look at this and go, ‘I don’t know if there will be enough women to see this.’ Because that’s your experience,” Pinkett Smith said of the typical Hollywood thought process. Until the time when women, people of color and other marginalized groups of society are represented behind the camera, Pinkett Smith stresses that women in Hollywood can make a difference just by participating. “I think even as women, when we take on projects like this as actresses, we have to be courageous enough — and most of us do — to speak about helping to craft the story and craft our characters to more authentic spaces,” Pinkett Smith said. It wasn’t a huge ordeal or contentious back-and-forth, either. In Pinkett Smith’s own words, “There was no debating it. I really give them a lot of credit for that.” They gave these smart, talented, funny women license to be themselves. Are you listening Hollywood? Currently, that means teaming up with one young woman in particular: her 17-year-old daughter, Willow. 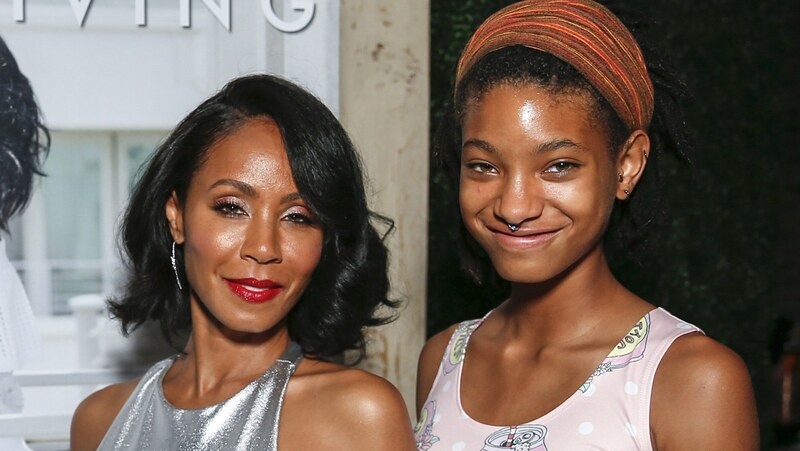 If you aren’t already stoked about the chance to see the mother-daughter duo perform, Pinkett Smith left us with one more teaser about what the future could hold — for her, yes, but also for other women in Hollywood. Girls Trip is out on DVD and Blu-ray now.